In this family history interwoven with recipes, Kathleen Flinn returns readers to the mix of food and memoir beloved by readers of her bestselling The Sharper Your Knife, the Less You Cry. 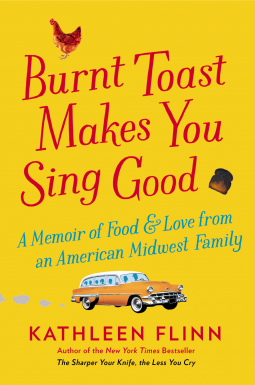 Burnt Toast Makes You Sing Good explores the very beginnings of her love affair with food and its connection to home. It is the story of her midwestern childhood, its memorable home cooks, and the delicious recipes she grew up with. Flinn shares tales of her parents’ pizza parlor in San Francisco, where they sold Uncle Clarence’s popular oven-fried chicken, as well as recipes for the vats of chili made by her former army cook Grandpa Charles, fluffy Swedish pancakes from Grandma Inez, and cinnamon rolls for birthday breakfasts. Through these dishes, Flinn came to understand how meals can be memories, and how cooking can be a form of communication. Brimming with warmth and wit, this book is sure to appeal to Flinn’s many fans as well as readers of Marcus Samuelsson, Ruth Reichl, and Julie Powell. We all know that there is such a thing as Comfort Food, but there is also Comfort Reading--those books that feel like a hug and restore your faith in everyday people. Burnt Toast Makes You Sing Good gives you both Comfort Food AND Comfort Reading! The Flinn family is a typical mid-Century, mid-American family. There are now celebrities in this family and the only one that crosses this family's path is Michael Moore in his younger years. They aren't the saccharine kind of family that you might find on a sit-com or family drama. No, the Flinn's are a fun and loving bunch who pull together through the ups and downs. Folks, I want to be a part of this family. The parents love each other (really, they are always running off on countless "second honeymoons"), they have an array of eccentrics in their extended family, and Flinn's sister actually runs away to be a clown! Yes, a clown! Oh, and then there is the food. Other than Julia Child's Beouf Bourginon, we aren't talking about "fancy" food. This is stick to your ribs and warm your soul fare. This is the kind of food that I grew up with--my mother being a good mid-Century, mid-American woman. And there are RECIPES! I really wish I had the hardcopy of this book as it would be easier to go back to the recipes! I related to this family--like Kathleen, I was the youngest by FAR and was at home long after my siblings had moved out (in my case, many of my siblings had moved out before I was born). While my family didn't especially struggle financially while I was growing up, there were some definite hard times before I came along. For readers who are into serious memoirs, this may be a bit light. For everyone else--especially foodies--this is a treat. I laughed, I sobbed, and I wanted to eat!